The UK government "distanced itself" from talk of removing Saddam Hussein in early 2001 despite concerns about his threat, the Iraq inquiry has been told. Sir Peter Ricketts, a top intelligence official at the time, said it was assumed it was not "our policy" despite growing talk in the US about the move. On the first day of public hearings, four senior diplomats and advisers gave evidence on the war's origins. The inquiry chairman has said he hopes to conclude his report in late 2010. Relatives of some of the 179 UK service personnel killed in Iraq gathered outside the venue in central London where the hearings are being held, as did a number of anti-war protesters. Tens of thousands of Iraqi civilians died during the 2003 conflict and in the years following it though estimates vary considerably. The long-awaited investigation into the UK's involvement in the run-up to the Iraq invasion, the war itself and its aftermath, is expected to last for more than a year. Former Prime Minister Tony Blair will be among the future witnesses. Tuesday's session looked at UK foreign policy towards Iraq in the lead-up to the war, which began in 2003. Asked about the threat posed by Iraq in early 2001, Sir Peter Ricketts, who was the then chairman of the Joint Intelligence Committee - which oversees MI5, MI6 and GCHQ - said it was palpable. Sir Peter, now Head of the Diplomatic Service, said there was a "clear impression" that Saddam had a "continuing intention" to acquire weapons of mass destruction, having used them in the past. However, Sir Peter said there was no-one in the UK government in 2001 "promoting or supporting" regime change, as it was assumed "it was not our policy that we were seeking the removal of Saddam Hussein". While there were "voices" in Washington calling for Saddam to be removed even before the Bush administration came to power in early 2001, this did not result in a change to the longstanding policy of trying to contain Iraq through sanctions, he said. The first members of the public arrived as early as 6.30am forming a queue outside the Queen Elizabeth II Conference Centre. The bereaved families of servicemen and women killed in Iraq have waited with a sense of expectation for this Iraq inquiry, the most comprehensive of all the investigations held in Britain. Among those here today was Rose Gentle, whose son Gordon was killed in Iraq in 2004. Also present, the sisters of the aid worker Margaret Hassan who was kidnapped and executed. In a small demonstration outside a group of three people wore face masks caricaturing George Bush, Tony Blair and Gordon Brown. Inside, in the sterile atmosphere of the public hearing room, the committee chairman Sir John Chilcot opened proceedings with a warning that this inquiry might not be completed until the end of 2010. That will not come as a surprise - Sir John has already said his committee has received "mountains of written material" to digest. Sir William Patey, then head of the Middle East Department at the Foreign Office, said the UK had been aware "of the drumbeats from Washington" when it came to regime change but wanted to "stay away from that end of the spectrum". Sir William - now ambassador to Saudi Arabia - acknowledged that international support for the sanctions policy in place against Iraq since 1991 - which underpinned the policy of containment - was steadily breaking down at the time. However, asked whether this policy - which critics said was ineffective and which was actually hurting the Iraqi people - could have "kept Saddam caged" indefinitely, he replied "possibly". Focusing on the impact of the 9/11 attacks on British policy, Sir Peter said it "added an edge" to existing concerns about Iraq seeking to acquire weapons of mass destruction beyond any international control. Despite there being no evidence of a direct link between al-Qaeda and Iraq, Sir Peter said there was a "tone of voice" in Washington after 9/11 that there would be "major implications" for Iraq if that was the case. US priorities after 9/11 remained al-Qaeda and Afghanistan, he said, but it became clear by the end of the year that the so-called war on terror was moving into a second, as yet, "undefined" phase. "It was clear from late autumn  that Iraq was being considered in a different light in light of the 9/11 attacks," he said. But he said he did not "recall" any conversations with British ministers or policy discussions in Whitehall about regime change at that stage. Other officials who gave evidence on Tuesday were former senior Ministry of Defence official Simon Webb and ex-Foreign Office legal adviser Sir Michael Wood. 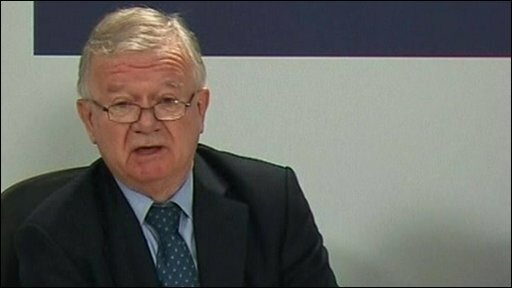 In his opening statement, inquiry chairman Sir John Chilcot said the panel had an "open mind" about the UK's involvement in the Iraq conflict and its aftermath. He said it was the panel's job to "establish" what happened in Iraq - "to evaluate what went well and what did not, and crucially why" - so that lessons could be learned. He intended to produce a report which was "thorough, impartial, objective and fair", stressing that it would not hold back from criticising institutions and individuals where this was "truly warranted". While most hearings would be held in public, Sir John said he reserved the right to conduct sessions in private where issues directly affecting national security were addressed. The members of the inquiry's committee were chosen by No 10, leading critics to ask whether it can be independent of the government. I confidently predict that by the end of this inquiry the British public still won't know why we sent troops to Iraq or what advice the government was given regarding the war's legality. Over the coming weeks the inquiry is expected to hear from a succession of diplomats, military officers and politicians, including Mr Blair, who is due to appear early in the new year. Former Lib Dem leader Sir Menzies Campbell said Tony Blair and his advisers would have to answer "profound" questions about the reasons for going to war, why post-war planning was so "poor" and why so many Iraqis died during the period of British engagement in Iraq. "As you have seen from the reaction of the relatives of those who were killed in Iraq there is an awful lot of emotion around," he said. "I think it will be quite a difficult occasion for Mr Blair." Previously, the Butler inquiry looked at intelligence failures before the war, while the Hutton inquiry examined the circumstances leading to the death of former government adviser David Kelly.